Our choir was established in late 2004, the brainchild and inspiration of Mike Elliott and Caroline Bradley. From the outset it was determined that the choir would be truly international and so it has evolved, with members from many nations. 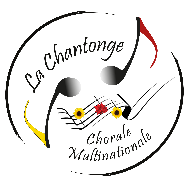 The name “Chantonge” derived simply from our occupation and region (Chanter and Saintonge). We are an Association based and registered in 17400 FONTENET and the majority of our rehearsals take place there as well. Our aim is to make good choral music to warm the hearts, minds and souls of both our public and ourselves. In this way, we believe we cannot fail. We are not dedicated to any particular period or nationality of choral music, in fact, quite the opposite. We have and will continue to performed music from throughout the ages…from mediaeval to absolutely modern, composed specifically for us. We always try to achieve a mix and balance in our concerts, which will satisfy our loyal and growing public. So far we have succeeded, but we do not rest on our laurels. We also take into account the suggestions of our audience and, in fact, some of most popular numbers have come from the wishes of our fans!